Thus the photo above of Stephan, Workcycles shop foreman and generally amazingly handy guy… carrying a small tree in a box a few kilometers home after work. 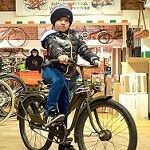 His bike of choice? A filthy but perfectly functional, pre-war Magneet Opafiets. 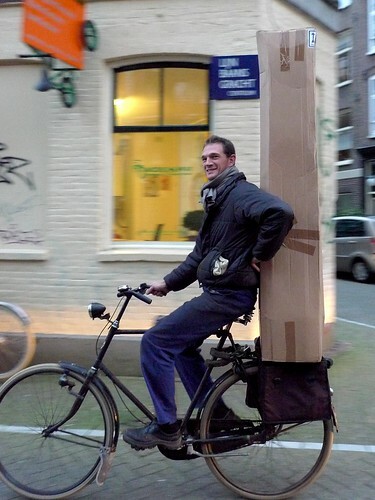 Not only is no special bike or carrier necessary, Stephan didn’t even bother to secure the tree. Nope, just like the Dutch carry a crate of beer balanced on the rear carrier Stephan rode home with one hand on the handlebar (Yay for coaster brakes!) and one hand steadying the tree. I was cycling the other direction to pick up my son at the daycare but I imagine Stephan just rode a little slower than usual. I’m sure the time “lost” by cycling slowly was more than compensated by the time “saved” in skipping the special preparations… if those couple minutes are even relevant. Perhaps more relevant is that riding that tree home by bike was the only imaginable transport solution. Had it been bigger he would have borrowed a bakfiets for the evening. 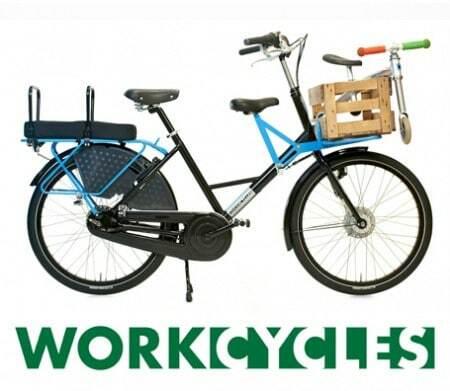 Every Workcycles employee cycles to work every day, not out of idealism or self-sacrifice but because that’s just the best way to get around. Actually from our perspective its the only way to get around. In a town where it’s as normal as day and night to ride bikes one hardly even knows how to go about their business by another mode of transport. I’d rather just get wet on a rainy day than search out the best way to go by tram. I find driving a car annoying only partially because of the traffic. The bigger issue is that I just don’t know which routes to take, what the parking rules are in various districts or even how to operate the strange parking ticket machines. All that and we don’t have a car anyway. My morning route consists of cycling my son two kilometers to the daycare and then continuing on about a kilometer to work. Evening is the opposite. We do this in sun, rain, snow and winter darkness and I’ve never really considered another way to do it. Why would I? Cycling with Pascal is one of the highlights of the day. Another difference between an established cycling culture and the emerging one is that people don’t look for excuses to ride, nor do they often gather for the purpose of riding (a certain type of) bikes. Critical Mass, Tweed rides, Cycle Chic rides, bicycle house moves etc are certainly all harmless fun and, depending on your perspective, good or bad for the promotion of cycling. But for me there’s just something artificial or staged about them. Take the tweed/cycle chic rides for example: I totally understand and respect the reaction to the dominant male, techno-equipped lycra/carbon/helmet cycling look and attitude of the emerging cycling culture. But isn’t there a danger that the tweed chic costume thing just makes cycling from A to B to C too elitist and class stratified in the other direction? In any case tweed/chic rides, critical masses and the likes are irrelevant in the Netherlands, perhaps much in the same way fixed gear bikes won’t catch on here; These are artifacts of an emerging cycle culture. Come to think of it it’s very common for one to move their furnishings from one apartment to another by bike, more specifically with a big bakfiets. However it’s just called “moving” and not a “carfree bike move”. The difference in the examples above is that riding bicycles is being enjoyed but not celebrated; it’s just the means to another end. 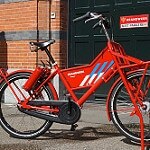 This entry was posted on Tuesday, October 26th, 2010 at 12:00	and is filed under About WorkCycles, Antique/old bikes and history, Bikes in use, Practical cycling, Workbike / Transportfiets. You can follow any responses to this entry through the RSS 2.0 feed.You can skip to the end and leave a response. Pinging is currently not allowed. With you 100%! This is a very accurate description of how I – as a Dutchman – see cycling. one hardly even knows how to go about their business by another mode of transport. I’d rather just get wet on a rainy day than search out the best way to go by tram. […] I just don’t know which routes to take, what the parking rules are in various districts or even how to operate the strange parking ticket machines. All that and we don’t have a car anyway. That could have been my text! So does this mean that an established cycling culture is no cycling “culture” at all? Perhaps the Netherlands has a “cycle-oriented culture” rather like we could say that the US has an “automobile-oriented culture”. That’s quite different from the typical use of “cycling culture” referring to cyclists who band together because they ride bikes, often specific types of bikes. Amongst transportation cyclists that’s practically nonexistent in the Netherlands. Actually even the competitive and hard-core recreational cyclists I know here tend to be much less absorbed with bikes and their being bike riders than their peers in other countries. I’m not sure whether that’s good or bad but it is different. What a hilarious, wonderful post! Thank you for giving me something good to read today! That’s exactly the point. 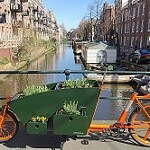 People move their belongings by bakfiets in Amsterdam only because it’s cheap, convenient and doesn’t require a driver’s license which many (especially younger) people don’t have. In older Amsterdam homes furniture is lifted and lowered via a rope and pulley (called “touw en blok”) because the stairways are very narrow and steep, and have 180 degree turns at each level. This is why the buildings have that hook sticking out of the roof. 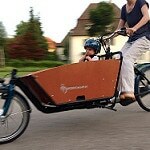 The bakfiets works really well in combination with the touw en blok since you can hoist directly from the bakfiets without having to load and unload a truck. 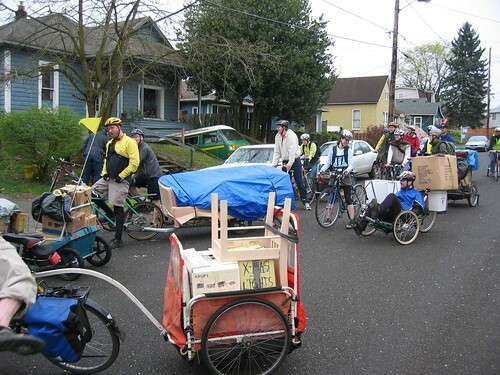 The Carfree Bike Move, on the other hand, is primarily an idealistic endeavor since it’s likely that a van would be more practical in that environment. On the other hand it’s probably fun to strap a table to a recumbent and then keep an eye on it with your helmet mounted rear-view mirror as you ride. Nicely played. I agree 100%. Seriously Henry, add my Ikea pic. 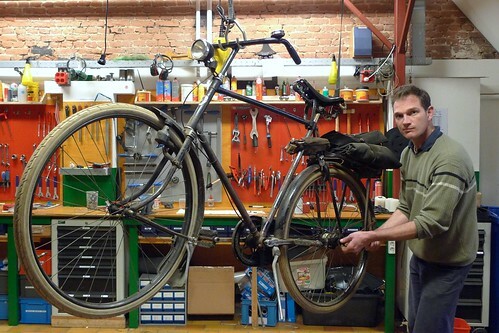 That is (also) a prime example of Dutch bike minded culture. 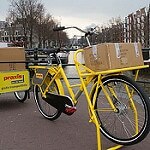 Even if -as a cynic – one were to say the Ikea bike is a marketing gimmick, only a Dutch Ikea would actually do it. OK, maybe a Danish one too. It was a lovely Sunday, October 10, 2010, with sunshine abundant and warm temps and a gentle breeze (actually, a mini-gale) blowing from Germany across the border into the Netherlands. I sat up straight that day and let the wind carry me along, from Bunde to Bad Nieuweschans and finally to Groningen, my stop for that night. Western European border crossings today have none of the hassle of twenty years ago — there’s perhaps a bump in the road or a sign — but I have to say the cultural indicators were perhaps more telling than any fences might have been. Beginning some ten kilometers on the German side of the border, I began to see more couples on their bicycles, out for a pleasant ride, and small groups taking in the fall colors. 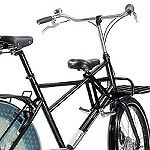 Once in the Netherlands, it was a relative flood of cyclists, young and old, on their oma/opa fiets, saddle bags attached, and pedaling carefree through the greenery. The first “real” Dutch bicycle path I hit was a revelation: easily ten feet (2.5 m) wide, with flawless pavement, and plenty of room for anything human powered that chose to use it, except for the scooters, which I could have done without. In Alaska, private pilots are more numerous than probably anywhere else in the world: the demands of the terrain and limited development make them necessary. It’s not so clear to me why bicycles are so popular for the Dutch, but not, say, the Germans, just across the border. I’m sure it’s a question that has been much debated and explained, with answers rooted in historical, economic, and political events. Whatever the case, it’s a culture to be celebrated! * Germany is very large (even before unification) which means that lots of business had to be conducted at long distances. This is why many parts of the autobahn have no speed limit and so on. * Most cities in Germany got bombed to Hell in the War which enabled car-oriented road development inside cities. They are so many incredibly wide streets in Berlin. (On the other hand, there is Amsterdam). 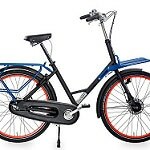 * Most current German bicycle design has at least a somewhat sporty, slightly aggressive design, focused on speed. Built-in lights are standard on many models now, but there is also a law against riding anyone on your rear rack (which means rear racks are flimsy and people put baskets on them). 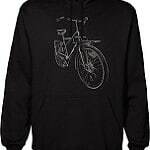 * There are very few bicycle assimilation courses, e.g. in Berlin ADFC does not offer any adult cycle training. Considering the number of immigrants in Berlin and elsewhere (from the Global West, East and South), this is absurd, and creates a lot of bad cycle behaviour, or of course no cycling. 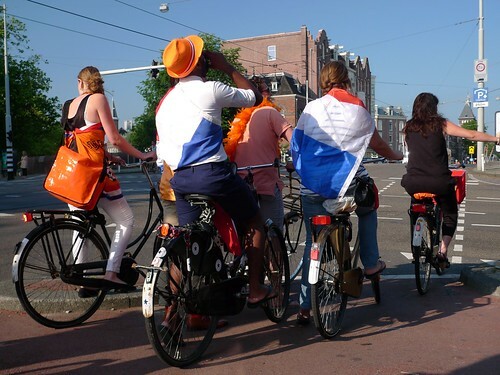 (I know that the Netherlands is over-rated in this area, but there is will, though just lackluster support from government and perhaps some male flag wavers of the “Dutch Cycling Paradise” are a little insensitive about it). * Berlin still has many areas where it is free to park a private automobile. @Brent: To be clear a lot of what I was talking about referred to Berlin only. Conditions for cycling are much better in Copenhagen, which is a part of the reason the modal share is much higher there. The only real or perhaps just legal advantage in Berlin is that cyclists do not have to use provided paths. 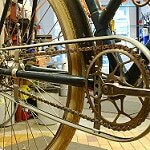 hey, french porteur bikes were not esoteric … in France ! René Herse bikes were high end material and thus a rarity, but utilitarian bikes with front racks were commonplace. Okee, okee… but my version made for a funnier read and besides, the American hand-builders certainly aren’t being inspired by the ordinary newspaper delivery bikes. Like the picture of schoolkids, but there’s only a few of them in it. I rode my bike to school for 6 years (12 when I started). 10 km single route (so 20 every day). On good days you could see a group of at leas 20-30 kids going our way in the morning. The pack provided shelter from storms, help when tires got flat and company on the trip, as well as teaching all those kids how to behave when surrounded by other cyclists. The whole thing has always given me a feeling of control; this is my bike, these are my friends and we are going somewhere. 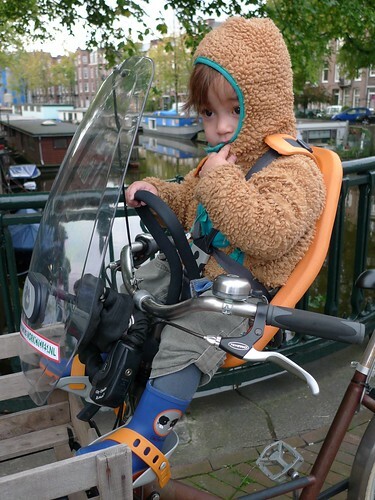 Here in A’dam it’s not common to see more than a handful of kids cycling together. But I have heard your story from others who grew up in smaller towns. Some kids loved it and developed a lifelong affinity for cycling, while others grew to dislike cycling as a result. 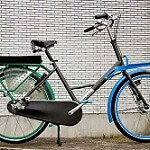 Really enjoyed this post and am a big fan of WorkCycles (even though I ride a Velorbis). I do get what you’re saying about Tweed Runs, Cycle Chic and Bike house moves, however I think there is another side to the coin as well. 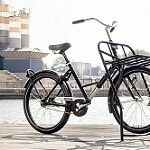 The Netherlands has had a bicycle oriented culture for more or less the last hundred years, which has thrived in spite of the rise of cheap petrol/automobiles in the 50s and 60s. 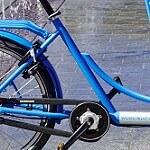 Most of the rest of Europe/USA discarded bicycles in the same era and for the same reasons. for everyday life, but I think that Tweed Runs etc, are all just part of the birthing process of this normalisation and re-integration of the bicycle into peoples lives and I guess that in another 30 or 40 years, that we will probably have the same view of cycling, as you do in the Netherlands, with your unbroken cycling tradition and cosmology. We just need a wee bit of time to catch up, and if that means in the meantime that a few folks have a good time on their bikes dressed in Highland tweeds or come together as communities/friends to shift stuff from house to house, then what harm is it doing? 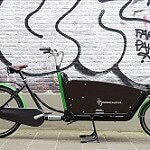 Even though I’m way up here in the Scottish Highlands, I am very aware of how popular WorkCycles, Velorbis etc are becoming in the US, due to folks like The Dutch Bike Co etc. If I was in America riding around on a Pastoorfiets or Secret Service and read this, I have to say that I’d feel a wee bit gutted that the fella who made my bike was laughing up his sleeve/ slagging me off, for the way I was choosing to use my bike. 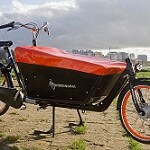 I happen to think that you make fantastic bicycles and if it had been possibe to get a hold of a WorkCycles Pastoorfiets, without going to the hassle of importing it, or flying to Holland to pick it up, that would certainly have been my first choice over the Velorbis (which is also a fantastic bicycle). But I think you may be in danger of alienating folks who are thinking about starting to use bicycles in whatever way, with this slightly Calvanistic approach to anybody who maybe wants to have a bit of fun on their bike as well. Thanks for your feedback and compliments but I just reread this post from about a year ago to be sure and I just don’t see what there is to object to. So summing up my approach is in no way hair-shirt Calvinistic; It’s about preferring the bike so much above other forms of transport that even crappy weather isn’t enough to shift the balance. Ahem…Got a wee bit carried away there and read the article and comments in one go and as a complete piece in itself, Re the car/van stuff!…. please accept my sincerest apologies. I think Calvin would have loved to be the inventor of the hair shirt, but the opposition really thought of it first, centuries earlier :-).